TestFacts.com, the site that evaluates and selects the best products in multiple categories, has named Procella Umbrella the #1 choice for its annual list of Best Umbrellas for Wind. 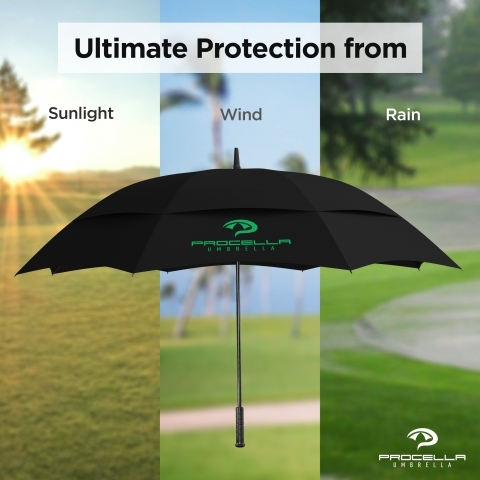 Procella is renowned for high-quality manufacturing of golf umbrellas and designs that offer unique wind resistance. Las Vegas –– Procella Umbrella, known for making some of the most popular, highly-praised umbrellas on the Internet, today revealed that it has been selected as the number one choice for umbrellas that provide wind resistance by TestFacts.com. Procella’s popular 62” Golf Umbrella topped the site’s 12 Best Umbrellas for Wind in 2017 list. TestFacts.com subjects products to rigorous, expert inspection before announcing its best selections in a variety of consumer categories. Procella Umbrella is indeed famous for making high-quality windproof umbrellas. Procella’s umbrellas have been a proven hit with consumers, on the look-out for large rain umbrellas and they have pushed the brand to Number One Bestselling status on Amazon. Owners are enthusiastic about the rugged, high-quality construction of the Procella Umbrella. Their Golf Umbrella features a strong fiberglass shaft/rib design and double vented canopy. It has been tested in a skydiver wind tunnel at 46mph. The 62” Golf Umbrella is available in grey, black and navy blue as well as color combinations of green and white, red and white, black and white and blue and white. It has the following dimensions: Canopy – 62 inches; Length – 39 inches; Width – 52 inches. It weighs 1.7 lbs. The umbrella sells for $33.99, a sale price. Procella Umbrellas has a “no return, just replacement” policy. If a customer finds that his or her umbrella is broken, they don’t have to ship it back to Procella. If they have registered their umbrella to the company’s “Lifetime Guarantee” program, the customer can simply contact Customer Support to initiate the guarantee process. The 62” Grey Umbrella is available on Amazon.com and the Shopify Store.